What is the LL-RLP-20 or LL-RXR-27 Module? 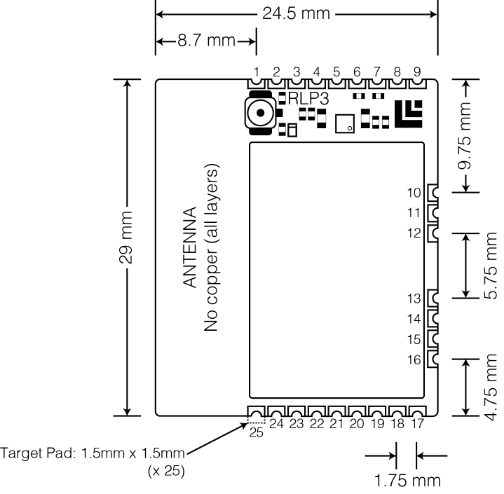 The LL-RLP-20 or LL-RXR-27 Module is a highly-integrated, low-power, bi-directional radio transceiver module. The modules are optimized for use either in the 915-MHz ISM frequency band or the 868-MHz ETSI frequency band. The modules use a Frequency Modulated Chirp (Semtech's LoRaTM modulation) to maximize range while minimizing power consumption and interference. The LL-RLP-20 and LL-RXR-27 are essentially identical, with the exception that the LL-RXR-27 includes an onboard power amplifier in the transmit path and a low-noise amplifier in the receive path. The maximum transmit power of the RXR-27 therefore exceeds that of the RLP-20 by approximately 6 dB. The following table presents the hardware specifications of the LL-RLP-20 module. The following table presents the hardware specifications of the LL-RXR-27 module. The following table presents the applicable frequency bands according to ERC Recommendation 70-03. The LL-RLP-20 and the LL-RXR-27 share the same footprint and pinout. The following figure depicts the footprint of the LL-RLP-20 and/or LL-RXR-27 module. 1All not-connected pins should be floated. 2RF connection is via U.FL connector on upper left side of the module or pin 2. 3RF output is 50 Ohms, DC blocking capacitor not required. 4If using VBAT, must tie LDO_OUT to VCC. 5If Pin 14 is floating or high, UART baud rate is 115200. If Pin 14 is grounded or low, UART baud rate is 9600. 6Default UART baud rate is 115200 8n1. Because the LL-RLP-20 and LL-RXR-27 and their associated antennas have been certified by the FCC and Industry Canada (IC) as a Modular Radios, the end-user is authorized to integrate these modules into end-products, and is solely responsible for the Unintentional Emissions levels produced by the end-product. In order to preserve the Modular Radio certifications, the integrator of the module must abide by the PCB layout recommendations in the following paragraphs. Any divergence from these recommendations will invalidate the Modular Radio certifications and require the integrator to re-certify the module and/or end product. The following applies to both the LL-RLP-20 and the LL-RXR-27. 1/2-wave center-fed dipole antennas tuned for 915 MHz with a maximum gain of 1.9 dBi or less, such as ANT-916-CW-HWR-SMA. This article provides reflow guidelines for surface mounting the LL-RLP-20 or LL-RXR-27 module to a carrier board using lead-free solder. None of the components on the LL-RLP-20 or LL-RXR-27 are particularly sensitive with regards to peak reflow temperatures. Printed circuit board manufacturers may therefore typically rely on solder paste guidelines to construct a reflow profile. The following temperature-time profile is used to surface mount the LL-RLP-20 or LL-RXR-27 to its Evaluation Board. 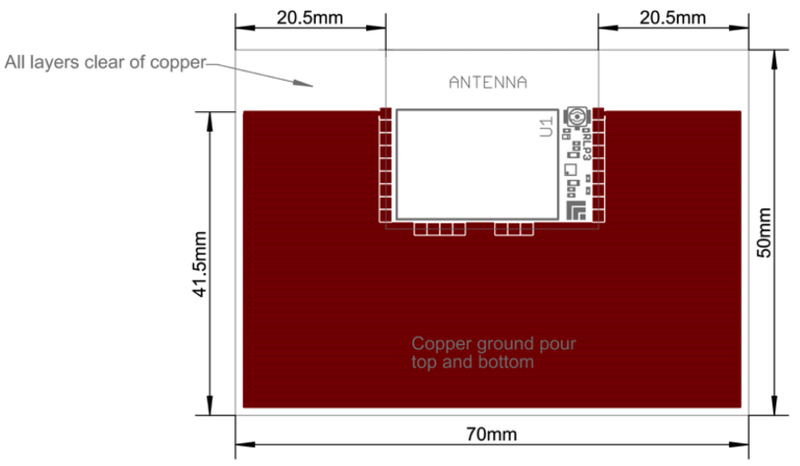 To satisfy FCC RF exposure requirements for mobile and base station transmission devices, a separation distance of 20 cm or more should be maintained between the antenna of this device and persons during operation. To ensure compliance, operation at closer than this distance is not recommended. The antenna(s) used for this transmitter must not be co-located or operating in conjunction with any other antenna or transmitter. "Contains Transmitter Module FCC ID: 2ACT6LLRLP20" and "Contains Transmitter Module IC: 12201A-LLRLP20"
"Contains FCC ID: 2ACT6LLRLP20" and "Contains IC: 12201A-LLRLP20"
"Contains Transmitter Module FCC ID: 2ACT6LLRXR27" and "Contains Transmitter Module IC: 12201A-LLRXR27"
"Contains FCC ID: 2ACT6LLRXR27" and "Contains IC: 12201A-LLRXR27"
The OEM of the module must only use approved antenna(s) listed above, which have been certified with the module. The OEM integrator should not provide information to the end user regarding how to install or remove this RF module or change RF related parameters in the user manual of the end product. Other user manual statements may apply. Conformité aux normes FCC Cet équipement a été testé et trouvé conforme aux limites pour un dispositif numérique de classe B, conformément à la Partie 15 des règlements de la FCC. Ces limites sont conçues pour fournir une protection raisonnable contre les interférences nuisibles dans une installation résidentielle. Cet équipement génère, utilise et peut émettre des fréquences radio et, s’il n’est pas installé et utilisé conformément ment aux instructions du fabricant, peut causer des interferences nuisibles aux communications radio. Augmenter la distance entre l’équipement et le récepteur. Branchez l’appareil dans une prise sur un circuit différent de celui auquel le récepteur est connecté. Les changements ou modififications à cet appareil sans expressément approuvée par la partie responsable de conformité pourraient annuler l’autorité de l’utilisateur de faire fonctionner cet équipement. This device complies with RSS-210 of the Industry Canada Rules. Operation is subject to the following two conditions: (1) this device may not cause interference, and (2) this device must accept any interference, including interference that may cause undesired operation of the device. To reduce potential radio interference to other users, the antenna type and its gain should be so chosen that the equivalent isotropically radiated power (e.i.r.p.) is not more than that permitted for successful communication. This device has been designed to operate with the antennas listed in the filing, and having a maximum gain of 1.9 dBi. Antennas not included in this list or having a gain greater than 1.9 dBi are strictly prohibited for use with this device. The required antenna impedance is 50 ohms. Cet appareil est conforme avec Industrie Canada exempt de licence Rss standard(s). Son fonctionnement est soumis aux deux conditions suivantes : (1) cet appareil ne peut causer d’interférences, et (2) cet appareil doit accepter toute interférence, y compris des interférences qui peuvent provoquer un fonctionnement indésirable du périphérique. Ce dispositif est conforme à la norme CNR-210 d’Industrie Canada applicable aux appareils radio exempts de licence. Son fonctionnement est sujet aux deux conditions suivantes: (1) le dispositif ne doit pas produire de brouillage préjudiciable, et (2) ce dispositif doit accepter tout brouillage reçu, y compris un brouillage susceptible de provoquer un fonctionnement indésirable. Pour réduire le risque d’interférence aux autres utilisateurs, le type d’antenne et son gain doivent être choisies de façon que la puissance isotrope rayonnée équivalente (e.i.r.p) ne dépasse pas celle admise pour une communication réussie. Cet appareil a été conçu pour fonctionner avec les antennes énumérées ci-dessous, et ayant un gain maximum de 6,0 dB. Antennes pas inclus dans cette liste ou ayant un gain supérieur à 6,0 dB sont strictement interdites pour une utilisation avec cet appareil. L’impédance d’antenne requise est de 50 ohms. The use of radio frequencies is limited by national regulations. The radio module has been designed to comply with the European Union’s R&TTE (Radio & Telecommunications Terminal Equipment) directive 1999/5/EC and can be used free of charge within the European Union. Nevertheless, restrictions in terms of maximum allowed RF power or duty cycle may apply. The radio module has been designed to be embedded into other products (referred as ”final products”). According to the R&TTE directive, the declaration of compliance with essential requirements of the R&TTE directive is within the responsibility of the manufacturer of the final product. A declaration of conformity for the radio module is available from Link Labs, LLC on request. The applicable regulation requirements are subject to change. Link Labs does not take any responsibility for the correctness and accuracy of the aforementioned information. National laws and regulations, as well as their interpretation can vary with the country. In case of uncertainty, it is recommended to contact either Link Labs’ accredited Test Center or to consult the local authorities of the relevant countries. Link Labs, Inc. (hereafter referred to as ”Link Labs”), reserves the right to make corrections, enhancements, improvements and other changes to its products and services. Buyers should obtain the latest relevant information before placing orders and should verify that such information is current and complete. All products (also referred to herein as ”components”) are sold subject to Link Labs terms and conditions of sale supplied at the time of order acknowledgment. Link Labs warrants performance of its components to the specifications applicable at the time of sale, in accordance with the warranty in Link Labs’ terms and conditions of sale. Testing and other quality control techniques are used to the extent Link Labs deems necessary to support this warranty. Except where mandated by applicable law, testing of all parameters of each component is not necessarily performed. Link Labs assumes no liability for applications assistance or the design of Buyers’ products. Buyers are responsible for their products and applications using Link Labs components. To minimize the risks associated with Buyers products and applications, Buyers should provide adequate design and operating safeguards. Link Labs does not warrant or represent that any license, either express or implied, is granted under any patent right, copyright, mask work right, or other intellectual property right relating to any combination, machine, or process in which Link Labs components or services are used. Information published by Link Labs regarding third-party products or services does not constitute a license to use such products or services or a warranty or endorsement thereof. Use of such information may require a license from a third party under the patents or other intellectual property of the third party, or a license from Link Labs under the patents or other intellectual property of Link Labs. Reproduction of significant portions of Link Labs information in Buyers’ data books or data sheets is permissible only if reproduction is without alteration and is accompanied by all associated warranties, conditions, limitations, and notices. Link Labs is not responsible or liable for such altered documentation. Information of third parties may be subject to additional restrictions. Resale of Link Labs components or services with statements different from or beyond the parameters stated by Link Labs for that component or service voids all express and any implied warranties for the associated Link Labs component or service and is an unfair and deceptive business practice. Link Labs is not responsible or liable for any such statements. Buyer acknowledges and agrees that it is solely responsible for compliance with all legal, regulatory and safety- related requirements concerning its products, and any use of Link Labs components in its applications, notwithstanding any applications-related information or support that may be provided by Link Labs. Buyer represents and agrees that it has all the necessary expertise to create and implement safeguards which anticipate dangerous consequences of failures, monitor failures and their consequences, lessen the likelihood of failures that might cause harm and take appropriate remedial actions. Buyer will fully indemnify Link Labs and its representatives against any damages arising out of the use of any Link Labs components in safety-critical applications. In some cases, Link Labs components may be promoted specifically to facilitate safety-related applications. With such components, Link Labs’ goal is to help enable customers to design and create their own end-product solutions that meet applicable functional safety standards and requirements. Nonetheless, such components are subject to these terms. No Link Labs components are authorized for use in FDA Class III (or similar life-critical medical equipment) unless authorized officers of the parties have executed a special agreement specifically governing such use. Only those Link Labs components which Link Labs has specifically designated as military grade are designed and intended for use in military/aerospace applications or environments. Buyer acknowledges and agrees that any military or aerospace use of Link Labs components which have not been so designated is solely at the Buyer’s risk, and that Buyer is solely responsible for compliance with all legal and regulatory requirements in connection with such use.